Disease caused by the bacterium Mycoplasma bovis in dairy herds can now be diagnosed more easily and quickly, resulting in better welfare for cows and reducing financial losses for farmers. By: Mette Bisgaard Petersen, Section for Animal Welfare and Disease Control, University of Copenhagen, Denmark., Liza Rosenbaum Nielsen, Section for Animal Welfare and Disease Control, University of Copenhagen, Denmark., Matt Denwood, Section for Animal Welfare and Disease Control, University of Copenhagen, Denmark. “The cows died and we had no idea why,” said farmer Tage Lausten to the Danish Farming News, seven years ago. Lausten felt powerless and did not know what to do when many of his cows contracted pneumonia and arthritis. What Lausten and the veterinarian did not know at that time was that the cows had been infected with the bacterium Mycoplasma bovis. Since then, at least 120 herds have had similar disease outbreaks with large consequences for animal welfare and economic losses for the affected farmers in Denmark. Our research shows that a relatively cheap and easy laboratory test can identify whether diseased cows in a herd are likely infected with the Mycoplasma bovis bacteria. This is done by measuring the amount of antibodies in the blood and milk of a group of cows. But the test needs to be conducted at the right time relative to the course of the disease, and correct interpretation of the test results requires knowledge of the disease. When cows become infected with bacteria or viruses, the immune system begins to fight the infection. Certain blood cells produce antibodies that help fight the infection. These cells remember and recognise the infection and react quickly if the cow becomes re-infected. It is the same mechanism that is used in many vaccines. For example, when a person gets vaccinated against tetanus, the amount of antibodies against the tetanus bacteria subsequently increases in the blood. Antibody responses can therefore also be used to provide a diagnosis for humans – or cows – by measuring the amount of antibodies against specific bacteria. These types of tests are often called antibody tests and they are common tools used for diagnosing diseases in both animals and people. The Mycoplasma bovis bacterium is rather special. It can influence the immune system so that it does not function so well. The bacteria can also change its surface to hide from the cells of the immune system, making it more difficult for them to recognise the bacteria the next time the animal is exposed to them. It is almost as if the bacteria wear invisibility cloaks. This is probably why the antibody test should be interpreted in a different way for Mycoplasma bovis than similar tests for other cattle diseases. To figure out how to interpret the test, we studied four dairy herds with disease outbreaks caused by Mycoplasma bovis bacteria. We measured the amount of antibodies against Mycoplasma bovis in blood and milk samples of both healthy and diseased cows over a 12-week period and compared the results. The antibodies fluctuated a lot and only increased in diseased cows for a short period of a few months. Importantly, this is in contrast to what is normally found for other diseases, where the antibodies can remain elevated for years after. Farmers and veterinarians need to consider this when using the test and interpreting test results. In addition, we found that the amount of antibodies produced in response to different clinical signs, varies a lot from cow to cow. This adds a further complication in diagnosing the disease. Moreover, our results show that testing for antibodies in milk samples can only identify cows with Mycoplasma bovis mastitis, and not Mycoplasma bovis pneumonia or arthritis. Given that the preferred method of testing in dairy herds is often on samples of milk, you can see how easy it is to miss. Our new results also show that antibodies vary from animal to animal, so it is important to measure the antibodies in a group of animals and not just one or two cows as is often done. Only then can you see if the herd has disease caused by Mycoplasma bovis. In 2011, when Tage Lausten and other farmers were losing cows to Mycoplasma bovis, veterinarians did not know how to interpret the antibody tests, which made a quick diagnosis and treatment difficult. These new results will help farmers like Lausten and veterinarians to quickly identify Mycoplasma bovis infections and administer the correct treatment and control measures. This will make it easier to spot the disease early on and limit the negative consequences for farmers and animals. In the longer term this could lead to the development of new certification programs, where herds are continually tested and transmission of the infection between herds can be reduced. The figure below shows the association between the average level of antibodies in blood (vertical axis) and the time from when the cows become sick (horizontal axis). The different colours represent groups of cows with different clinical signs of disease. The thick red line is the average antibody-level measured in blood samples of cows with arthritis caused by Mycoplasma bovis. Notice that the antibodies peak approximately 15 days after the cows get sick. 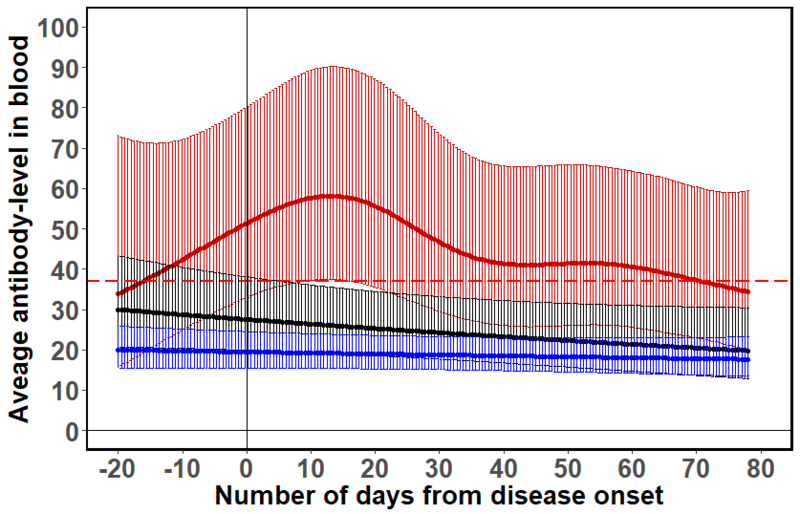 The antibody-response thereafter declines and is below the recommended cut-off for differentiating diseased from healthy cows after 60-70 days (red dashed line). The shaded areas are the 95 percent confidence intervals, which indicate how certain we are about the true level of average antibodies. If the shaded area for each of the red and blue lines do not overlap, then we can be certain that the average antibody-level in these two groups of cows are different. The antibody test therefore seems to give us 60-70 days to find out if the cows are likely diseased by Mycoplasma bovis. Looking at the graph, it also appears to take a few weeks to develop clinical signs of Mycoplasma bovis disease. The antibodies begin to increase a few weeks before the clinical signs are visible. This is important knowledge for the prevention of the disease. By increasing the monitoring of the cows in the herd farmers will be able to begin treatment as soon as they see subtle clinical signs of disease or detect an increase in antibodies. This will not only help to prevent the spread of the disease, but also save cows from a painful and loss-provoking disease.